Bred for Ability, Temperament and Style!! We produce puppies that have strong natural abilities both in the field and water, combined with excellent dispositions. A distinct difference, with this intense pointing dog, is their ability to train easily and quickly...even for the first time dog handler. We raise our puppies IN our non-smoking home. They are always current on ALL vaccinations and de-worming's which includes frequent, thorough, vet examinations in addition to receiving an ID microchip. Our puppies are socialized with children, adults and other canines. At an early age, they are taken to the field with our adult Braque du Bourbonnais, for travel and field exposure. NAVHDA (North American Versatile Hunting Dog Association) is the foundation registry and testing organization for the Braque du Bourbonnais in North America. Rufnit Kennels is the sole recipient of the prestigious "Natural Ability Breeder Awards" presented by NAVHDA for the Braque du Bourbonnais. These awards confirm that Rufnit Kennels is keeping on track with their breeding program. By NAVHDA using a "standard" for testing purposes, Rufnit Kennels can compare our Braque du Bourbonnais with other versatile breeds. We are producing superior Braque du Bourbonnais' with fantastic hunting instincts and abilities. Great dogs do not happen by accident and neither do our breeding's. 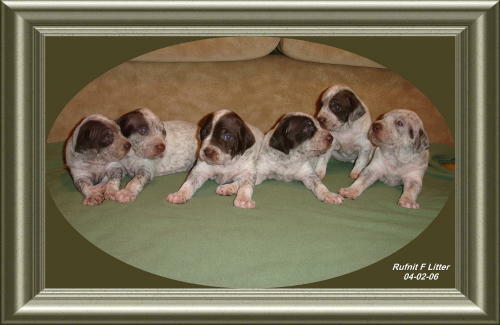 Each litter is planned and genetically calculated in advance for the improvement of the breed and our breeding program. To ensure the quality of our companions we take it a step higher than ever before, to DNA and Hip Certify our Sire's and Dam's. We sell to only responsible owners and utilize the "Breeding Restriction" registration offered by the NAVHDA registry. Rufnit Kennels assumes a lifetime responsibility for the canine lives we place on this earth. We require the dog/pup be returned to Rufnit Kennels should a situation arise and a dog/puppy need to be relocated. Our Braque du Bourbonnais are tested through the North American Versatile Hunting Dog Association. Testing our companions provides information on their hunting and physical abilities, as well as their mental stability. Rufnit Kennels has produced the youngest Braque du Bourbonnais to receive "Prizes" in Natural Ability through NAVHDA at five months of age (proving true Natural Ability), the Utility Preparatory Test at eleven months of age and the Utility Test at nineteen months of age. As for North American bred Braque du Bourbonnais', Rufnit Kennels' progenies notably dominate the NAVHDA Prize I NA's (~80%), with numerous progeny holding NA Prize II and NA Prize III positions! We request that the puppies be tested through NAVHDA. NAVHDA members provide invaluable training information for versatile hunting dogs. Rufnit Kennels offers a one time NAVHDA Natural Ability entry fee reimbursement (up to $100 US) for "Rufnit Companions" that receive NAVHDA Natural Ability Prizes (NA Prize I, NA Prize II or NA Prize III). As the above information indicates, our breeding practices are proving to be superior. ALL of our breeding's are matched up for the production of OUTSTANDING companions, in and out of the field. We are providing progeny with a solid foundation that each family/individual can build/mold to their personal styles/situations. Due to our reputation, dedication and proven breeding success, Rufnit Kennels maintains a companion waiting list. Remember that the least expensive part of the cost of a dog is its initial price. Vet bills, feeding, kenneling, training etc. are what really cost the most. Our advice: Do your research, you and your companion will benefit in the long run.